"The film stars Jake Gyllenhaal and Michael Pena as two cops assigned to South Central L.A. Pena's character is of Mexican descent and from East L.A.... When End of Watch debuted over the Sept. 21-23 weekend, 32 percent of the audience was Hispanic, both Spanish- and English-speaking (separate breakouts by language aren't available). The film, distributed by Open Road Films on behalf of Exclusive Media, won the frame, grossing $13.2 million (a solid number for an indie)..."
But studios and distributors walk a fine line between promoting the film's minority appeal to get minority audiences and downplaying it's strong minority presence to avoid alienating white audiences. 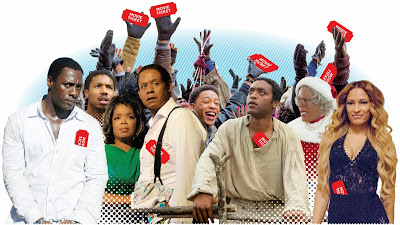 As a 2011 study confirmed, white moviegoers believe that films with minority stars are not made for them. "Andrew Weaver of the Indiana University Department of Telecommunications explored how the racial makeup of the cast impacts the preferences of white filmgoers. Writing in the Journal of Communication, he described an experiment in which 68 white college undergraduates read 12 fictional synopses of new romantic comedies. After looking over the pages, which featured small photos of the principal cast members, participants were asked a series of questions about their moviegoing habits, racial attitudes and desire to see each movie, either in a theater or at home. Seems a little messed up that white audiences won't watch a movie with minority casts in the same numbers that minorities will come out for a movie with white casts. And studios, believing this is simply a social truth, are reluctant to change that by making more movies with more minority casts in it even though the international box office has more non-white audiences than it does white audiences (although, trying to reach this international box office might actually be part of the problem). "While traditional fare such as Best Man Holiday is prospering, Fruitvale Station, Lee Daniels' The Butler and 12 Years a Slave have exceeded expectations by appealing to both black and white audiences. They defy the Hollywood convention (or stereotype) that black moviegoers are interested only in aspirational comedies such as Best Man Holiday or that white audiences won't watch a film about the black experience. "A quarter of a century ago, these movies wouldn't have crossed over to a white audience," says Erik Lomis, distribution chief at The Weinstein Co., which released Fruitvale and The Butler." "where does the assumption that white audiences aren’t interested in non-white characters come from? Why would a World War II movie with dogfighting pilots be interesting to white audiences if the pilots in question are white, a la Pearl Harbor*, but not if the men behind the controls are African-American, as they are in Red Tails? What makes an ensemble romantic comedy with a schticky premise where only one of the characters is black, as Chiwetel Ejiofor is in Love Actually, so wildly different from one where only one of the characters is white, as was the case in Think Like A Man? Why would we assume that only African-American audiences feel a need to reckon with the realities and legacies of slavery at a movie like 12 Years A Slave, a premise that suggests no white audiences anywhere feel shame or rage about our ancestors’ collaboration from a fundamental flaw in America’s origins, and the ways we continue to benefit from that flaw today? And why would anyone think that only African-Americans are affected when a young man is shot on a BART platform? That black men are targeted by law enforcement more frequently than white men or women doesn’t mean that the effects of such deaths are rigidly confined to African-American people, as if no white people anywhere have African-American family, friends, lovers, co-workers or co-parishoners. " "It’s true that part of the point of telling stories about non-white characters is to improve the variety of our storytelling, whether we’re putting new parts of familiar histories on the big screen, tossing new sorts of obstacles in lovers’ paths, or finding variations on family squabbles... audiences are obviously capable of–and interested–in engaging with all sorts of characters whose lives are different from our own. We happily consume stories about characters who are super-rich, or even whose real estate seems out of whack what they ought to be able to afford. We embrace criminal families and gobble up the exploits of super-people." In fact, part of what could be appealing to white audiences is how they relate more closely to their actual lives, "plenty of movies that are labeled “black films” portray characters and events that have more in common with the lived experiences of most white filmgoers than the events of movies that are blithely assumed to be accessible to white audiences." So the challenge for filmmakers and studios confronted with this paradigm developing right before their eyes is to continue to break down this "social truth" that white audiences (and by extension, international audiences) won't watch movies with minority leads and "try harder to sell movies to the audiences who ought to like them based on their content, rather than the race of the actors in question." Now as a filmmaker and distributer, you can still take a staggered and multi-pronged approach to target different audiences and appeal to them on a racial level because audiences conditioned by the society they grew up in will still respond to those dog whistles. But the times they are a'changin' and audiences are becoming more and more receptive to accepting a movie as simply a good movie or a bad movie (or an action movie or a comedy or a romance) over it simply being a black movie or a Latino movie or an Asian movie.